A delegation of about a dozen representatives from the Islamic party, Pas, made a courtesy call to the new Catholic bishop of the Penang Diocese, Sebastian Francis, at his office at the Cathedral of the Holy Spirit yesterday to congratulate him on his recent appointment. The delegation comprising mainly Penang Pas representatives was led by Parit Buntar MP Mujahid Yusof Rawa. Also present were College General seminary rector Fr Gerard Theraviam and Cathedral parish priest Fr Bernard Paul. Ustaz Soib Mohd Amin said a prayer for peace and for closer Muslim-Christian relations. Bishop Sebastian reciprocated by saying the Bapa Kami (Our Father) as a prayer for the nation. The new bishop also stressed the importance of cultivating a deep spirituality – an aspiration shared by people of other faiths – in forging closer Muslim-Christian ties. Both sides pointed to their common Abrahamic heritage, which could serve as a foundation to promote better inter-religious understanding. The Pas delegation then presented the Bishop with a book and a ‘good luck’ cake. 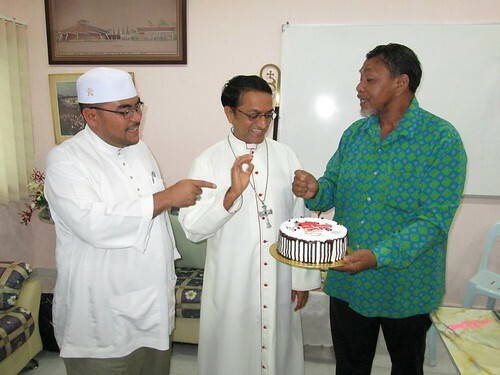 “This is specially baked for you”: Mujahid Yusof Rawa (left) and Tasik Gelugor Pas information chief Abdul Rahman Kasim presenting a cake to Bishop Sebastian. Bishop Sebastian later hosted tea and refreshments for the visitors. The meeting yesterday was initiated by Mujahid and Pas representatives, who had sent a letter to the bishop informing him of their desire to make a congratulatory visit. Shouldn’t the Padri stay out of politics? Remember Zaman French Revolustion. Malaysia is probably not ready to separate religion from the State. Meanwhile, this effort of religious tolerance goes a long way in establishing a peaceful coexistence. Good stuff. We need more. Nice cake too! Mutual respect! When will Malaysians ever learn this simple trait? I visited Kelantan and spoke to Chinese Shop-keepers and most of them are happy with the PAS State Government. Infact, they say its more peaceful than the capital. My Chinese friend from Sarawak did the same and shared my views. Good sign and its only just begun. We can live with differences though the idea will need to go through slow passage. Whether there is sincerity or not does not matter on this occasion. Let us not make judgment.Its a good beginning and lets move forward one step at a time to better religious tolerance and understanding. Why don’t u guys ever learn? The Ayatollah of Iran said, Jews in our country are our brothers. It is our duty to protect them. It is so refreshing to read news like this. It gives us hope that Muslims and Christians can live in harmony. Kudos to the Pas representatives. This is the answere the world is looking for. Exactly the antidote so needed to Innocence of Muslims furore. Well done PAS delegation and Bishop of Penang. Interesting move here, next it is your turn UMNO. Why do you say umno? Why don’t you say Perkasa? Quite true. I think it is high time religious leaders in our country stand in solidarity with Muslims in condemning bigotry around the world. But first of all, non Muslim leaders in Malaysia should reciprocate the olive branch extended by PAS leaders. Nice gesture but honestly, I was turned off by Nik Aziz’s recent call to boycott USA and Jewish products. In this day and age, calling for boycotts is immature and uncalled for. Everything we own and use are linked to these communities one way or another. We should promote love and forgiveness..after all, that’s what religion is all about. Hate only breeds hate, which is something that needs to stop. Just do it sincerely, and everything will be fine. One telephone call, and we can have a Padri (Bishop)and an Ulamak, siting together and having ‘teh halia tarik’ at the nearby mamak stall. That is more sincere friendship. What religion? Not important. We are all human. As long you do not force it upon another human being, we can live peacefully. Why must humans kill one another? An example Jakim and JAIS should emulate. Ridhuan Tee should emulate the behavior too! PAS shows Religious Muhibbah not seen among the ulamas from that divide and stir fear then rule regime ! No matter how insincere or superficial, we need more dramas like this one to ensure those anti-hudud guys vote pakatan. Why question the sincerity or judge the action to be superficial? UMNO/BN has been feeding us a steady dose of anti-PAS propaganda in the mainstream media to the point where few really understand the party. Until we know them, we should not judge. Accept the gesture at face value and celebrate because of it. Local democracy or local comedy?